Over at Geopolitical Intelligence Service (GIS) where I am a regular commentator I have a comment on Protectionism’s scary rise. Russia enacted more protectionist trade measures in 2013 than any other country, leaving it as the world leader in protectionism, according to a new study. Furthermore, Russia and its partners in the Customs Union, Belarus and Kazakhstan, accounted for a third of all the world’s protectionist steps in 2013, said the study by Global Trade Alert, or GTA, a leading independent trade monitoring service. A total of 78 trade restrictions, almost a third of all those enacted by Group of 20 countries, were imposed by Russian legislators last year, the study said. With the new restrictions, Russia now has 331 protectionist measures in place, or a fifth of all protectionist policies registered worldwide . Belarus is ranked second, with 162 measures. The Russian-led Customs Union, which the Kremlin has presented as an alternative to the European Union, came under harsh criticism from the report’s authors. “The Customs Union was responsible for 15 times as many protectionist measures as China while having only an eighth of the population,” said GTA coordinator Simon Evenett, in comments carried by Reuters. He described Russia’s policy of economic restructuring as “nothing more than a potent mix of rampant subsidization and aggressive protectionism,” which contradicts the World Trade Organization’s principles. Russia joined WTO in 2012. The other members of the Customs Union, Kazakhstan and Belarus, are negotiating entry into the WTO. A surge in protectionism occurred around the world starting in 2012, the report said. The 2013 data indicate that the trend, which could slow down international economic growth in the next several years, is likely to continue. Given recent events in Ukraine it is hard not to come to think of the old free trade slogan normally attributed to Frédéric Bastiat “If goods don’t cross borders, armies will”. PS if you want to think of a “model” of the recent rise in geopolitical tensions around the world then think of this causal relationship: Monetary policy failure => deflationary pressures => rising political populism and an increase in protectionist measures => increased geopolitical tensions. I will try to return to this topic in later posts as I increasingly think there is a relationship between monetary policy failure and increased political uncertainty and geopolitical tensions. 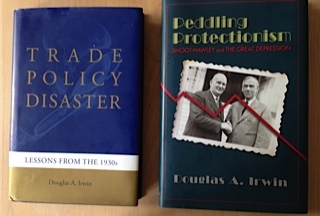 PPS 14 years ago I wrote a short article on the relationship between protectionism and war. You will find it here (page 25-26). It is unfortunately in Danish, but Google Translate might help you. PPPS a couple of posts on monetary policy failure in Russia. See here, here, here and here.